XMASS is a world class Test system with a high grade of flexibility. There is a wide range of usage options due to its modern and flexible based architecture. XMASS covers a wide range of testing requirements as a result of its independent modules and the selection of test devices offered. XMASS Application Server is used for test preparation, test execution as well as containing a central administration of test cases and scenario libraries and their executors. XMASS Application Server has a J2EE architecture which is easily administered through a web browser. The communication with XMASS Probes (PUX / MiniPUX / MicroPUX) takes place through the use of web service technology (SOAP). The XMASS Server is made up of many components that accompany the user on the journey from test preparation through to data analysis. 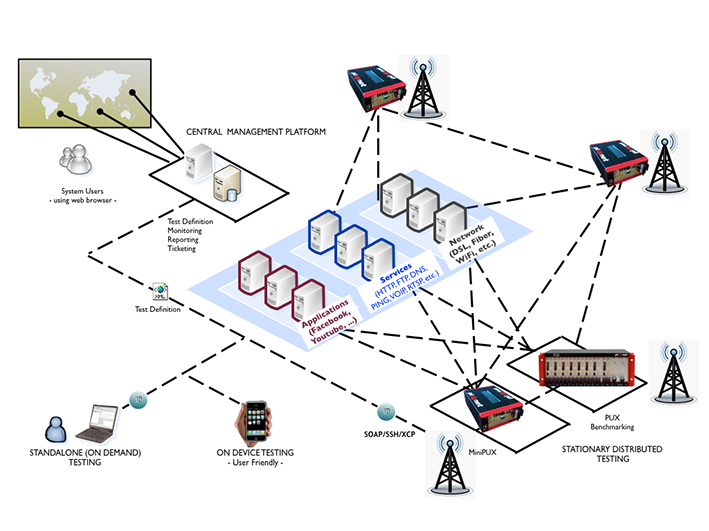 Within EMQP, XMASS is responsible for Test Scenario Design, Test Scheduling and Execution, Resource management and Probe Unit Management. 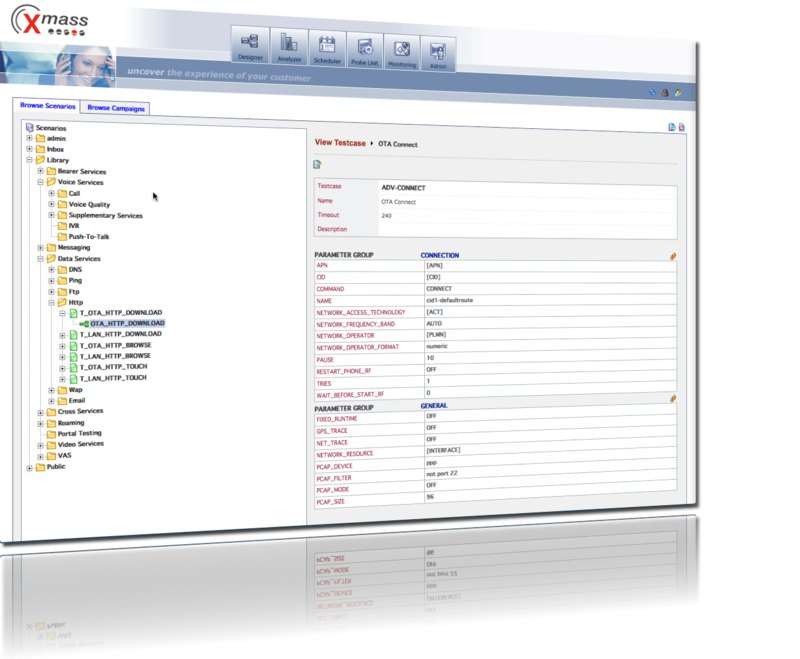 XMASS Provides a big range of test modules and a large ready to use test scenario library. XMASS allows to create custom test scenarios fully free and without any scripting or programming knowledge. 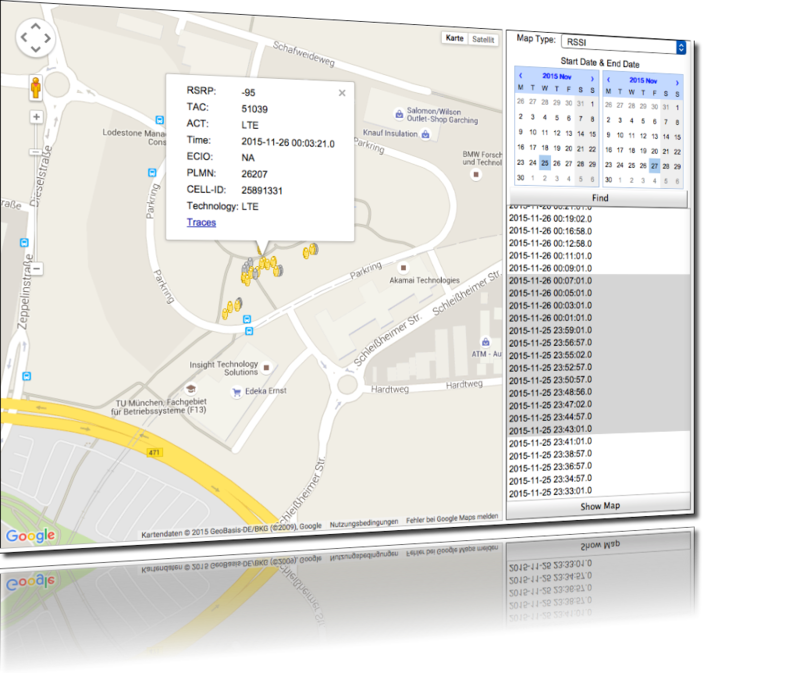 With XMASS, you have the best tool available on the market to simulate subscriber and device behavior against your network and services. In a highly competitive market, such as the telecommunications industry, providing and maintaining the highest quality of services for end customers is the key for a sustainable competitive advantage. Identifying the weak points can be difficult and many other weak points may remain undiscovered. XMASS powered by PIXIP.NET is a remote testing solution that provides near real-time monitoring of Quality of Service, by providing true end to end testing, simulating the customers experience. The system architecture is built on the latest standards in the IT and telecommunication industry. All test results are available using direct SQL access to the operative database as well as through data export interfaces such as XML, JMS or SOAP. Take advantage of XMASS and you can keep QoS under your control, prevent malfunctions and increase revenue arising out of your customers satisfaction. XMASS provides a very comprehensive reporting environment, including an off and an online report designer, a data warehousing layer, filtering features, archiving, collaboration capabilities, document management features and many more. By using these features, it is possible to create all kinds of statistics or reports. The communication between the system components is based on the web services technology. The data exchange is XML based. The test scenarios are also XML based so they can be modified using any text editor. It is also possible to exchange the scenarios using the import/export technology. The test probes and a central server communicate with each other, using the LAN connection or OTA connection (OTA control to probes requires SMPP connection to operator's SMSC). The test engine simulates the real subscriber and uses no other network resources than a standard subscriber. The system architecture contains two different servers – one for an operative and one for an analytical approach. Dimensioning the servers, depends on the number of users, the number of reports and monitors, as well as the number of tests. XMASS is completely module and plug-in based, both the central and the probe units and the system architecture is designed for expansions and customizations. The central unit application is also based on a J2EE technology that provides easy administration through a web server and easy upgrading of the system with expansions and customizations. The XMDL test definition language also offers the possibility to integrate probe units from other manufacturers into the system. Provides you with reliable information about the quality and performance of your network. XMASS covers a wide range of network technologies Like GSM, GPRS, EDGE, UMTS, HSPA, HSPA+, LTE, CDMA, PSTN, ISDN, and LAN/DSL. Numerous extensions can easily be added. Active End-to-End Service Testing for voice, call data and video call services, PTT, SMS, MMS, E-Mail, HTTP, WAP, FTP, PING, Video Streaming and VOIP. It monitors your voice, data and video services via relevant KPIs like duration, throughput or success rate. Determines the quality of your voice services with the aid of standard procedures like PESQ /MOS. Determines the quality of your video services with the aid of standard procedures like PEVQ /MOS. Determine the quality of CS-Video calls by measuring transmission BER. Monitor your streaming services like video service or music service and combine them with other basic services. XMASS offers a Roaming Packet with predefined Inbound / Outbound tests based on IREG, CAMEL, TADIG and GRQ Specification. Portal Testing for WAP, HTTP and cross-service portals. To view the XMASS Test Library click here. To view the XMASS-Whitepaper click here.